Ben 10 Sumo Slammer Samurai is the online game where you will get to see Ben as a samurai. Sounds so awesome. Run across Chinese villages and use your samurai sword to slam the alien robots to save the day! 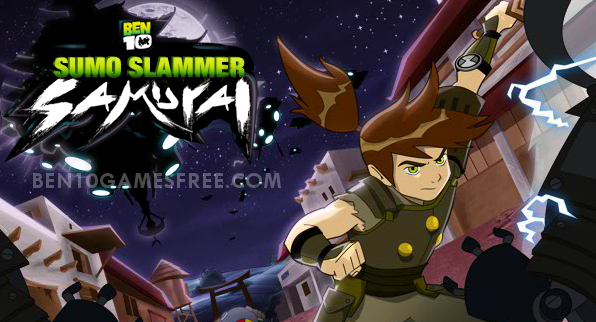 Want to play Ben 10 Sumo Slammer Samurai game online? Read out some important things below before you go for it. In this game, Ben is stuck in a video game called Summo slammer smackdown game. The mission of the game is to defeat the evil Kenko and recover the Ultra-T’s item. When you are playing with Ben as Samurai, you get to use all the samurai techniques and weapons. From samurai sword to the ninja stars, use everything and showcase your fighting skills in this adventurous Ben 10 fighting game. Unlike other fighting games, Ben 10 Sumo slammer samurai is also a running game. You have to help samurai Ben 10 to kill aliens that obstruct the path and run to end point of each level. Also, you have to collect the coins. These coins will add 10 points to your score for each coin collected. Pro Tip: Use ninja stars to attack enemies before they come to attack you! Do you think just our hero Ben can win them over? Well, if not then let me tell you, in this game, you can transform Ben into two very powerful aliens – Four Arms and Cannonbolt. No wonder they got all the power to defeat the evil Kenko! During the levels featuring the boss, there will be solid walls in between which Ben cannot jump over. There you must transform into one of the Aliens and destroy those walls to move forward. Well, now you are completely ready to take on Kenko in the Ben 10 Sumo Slammer Samurai game. Wait no more and head on to play this ben 10 game right now! As Ben becomes Samurai, Run, Fight and help him defeat the evil Kenko. Good Luck!! Don’t Forget to give your rating for Ben 10 Sumo Slammer Samurai game and share your tips and tricks to win this game in the comments section below.